Chickpeas are just great, It doesn't matter if they come out of a tin or are soaked over night and cooked. They're always rather wonderful. Mind you if you are buying tinned, look in the world food aisle of your local supermarket, you'll find the chickpeas there are cheaper and better quality. I like East End Chickpeas. They're big and creamy, just as they should be. I can eat them like sweeties. This chickpea salad with tomato sauce and wakame seaweed is a great lunchtime salad served cold or you could serve it warm as a side dish. It's packed with protein and lots of hidden veggies, so it's super healthy too. I can't take the credit for this recipe however, it comes from The Greenwich Market Cookbook, which is full of recipes from the traders at Greenwich Market in London. As you can imagine the recipes travel around the globe and back again from empanadas to ravioli and burritos. It's not all veggie but it has a great veggie and sweet thing section. 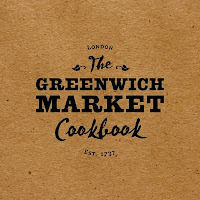 It's a rather nice cookbook. The photos are all matt and each recipe is given a page and lots of room. I hate when recipes are crammed in. 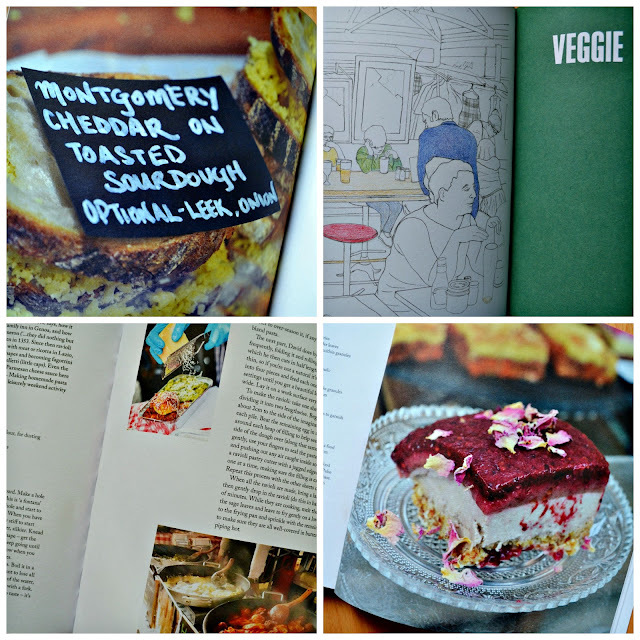 It's also full of photos of the dishes, the market and lots of illustrations that bring the book to life. The recipes are simple to follow and make. Real comfort food. This recipe comes from Emilia Silvas from Return to Shashamane. Emilia is from Romania and she takes her inspiration from there. Her recipes are all vegan with lots of Middle Eastern influences but with added superfoods. 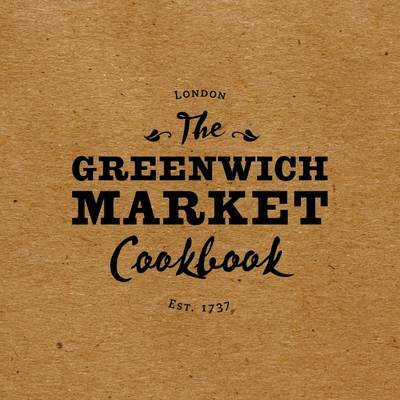 She makes lots of salads and mezze and you can try her food all day Saturday and Sunday in Greenwich Market. A cold chickpea salad in a tomato sauce that's packed with veggies and seasoned with wakame seaweed. An easy recipe that's super easy to make and healthy too. Serve it for lunch or as a side salad. 1. If using dried chickpeas, soak them in plenty of cold water overnight or for at least 8 hours. Drain, and put into a large pan with the bay leaf, peppercorns and a pinch of salt. Cover with water, bring to the boil and simmer until absolutely soft – this can take 1–2 hours depending on the age of your beans. 2. While the beans are cooking, make the sauce. Preheat the oven to 200c /180c fan/400f/ gas mark 6, and put the red peppers on a baking tray. Roast them for 30 minutes, turning every so often, until they are soft and slightly charred. Put the peppers in a bowl, sprinkle with salt and leave them until they are cool enough to be handled. Then peel the skin off, remove the stalk and seeds and blitz them in a food processor. Boil the carrots in plenty of water until very tender, then drain and finely chop. 3. Put the sunflower oil in a large pan over a medium heat. Add the onion and fry until soft but not coloured, then stir in the paprika and the coriander seeds – Emilia keeps them whole for a bit of texture, but if you want a stronger flavour you could grind them before adding. Add the peppers and carrots, then stir in the tomatoes and leave it all to simmer on a low heat for about 30 minutes. Add salt according to taste and leave to cool. 4. Drain the chickpeas and stir them into the tomato pepper sauce. Put the wakame seaweed and a pinch of salt into a small bowl and cover with water. Leave to soak for 10 minutes or so, then take out the seaweed and chop it roughly before mixing into the chickpeas. Just before serving, stir in the mustard seeds. 5. Enjoy! Disclosure: Kitchen Press sent me this cookbook to review and gave me permission to publish the recipe. I like to promote Kitchen Press as they are a small (but award winning) Scottish publishing house based in Dundee. They did not expect a positive review and any opinions expressed are my own. I'll have to have a look for that Stuart. I too love chickpeas and seaweed and when I saw the title of your post pop up in my feed I had to have a read! That just rhymed! I can't wait to try this one night for dinner! I could eat chickpeas like sweets too, especially if they are roasted. This looks like a really good way to use them too. That's something I really need to do Dannii, roast some chickpeas. I don't know why I never get around to it. This sounds delicious. I usually make hot dishes with chickpeas but would certainly give something like this a go. Yes chickpeas are great either just warm or cold in salads. So much flavor packed into that dish, yet still easy to make. Sounds delicious! Exactly, it's a fab dish. An all round winner. This cookbook looks lush - just the kind I love to curl up with on the sofa and dream about making things from. I love chickpeas, so it's nice to find a new recipe that makes the most of them - yum! Yes, I've only been using it as a seasoning occasionally. I hadn't tried this type of seaweed before. This looks like an interesting combination. Where would I buy wakame seaweed? Also, do you think it would work with lavabread? I always buy the East End chickpeas - 39p a tin, bargain! It took me years to decide that I liked chickpeas for some reason but I do and this recipe looks great.